Happy Holidays: Lots of work to do. The title says it all. I have a ton of work to get ready for September and that is all that I am saying about that. 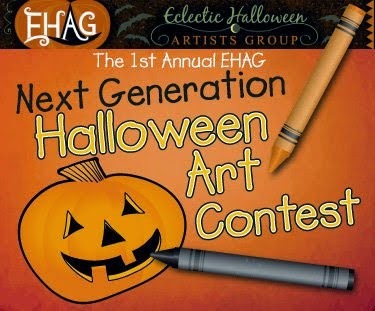 Don't forget to spread the word about EHAG's "1st Annual Next Generation Hallowe'en Art Contest". Click here to go to the blog post about the contest. The lucky winner will get a $100.00 Gift certificate to an art supply store of their choice. That is one wonderful prize! I will be back in about a week just to update my progress, maybe with a sneak peek of some work. I have been told that I don't give very good sneak peeks, that I am stingy with previewing my work. I like it to be a surprise. Let me know what you think and what you would like to see. I also have almost completed a post about the history of the birthday chair and how to make your own birthday chair with step by step pictures.